Double, double, toil and trouble - Halloween is almost upon us. As the air grows cold and the leaves change colour, it's time to get our pumpkin carving knives and fake blood ready for eerie celebrations. Easy to travel to from the West Midlands and Shropshire, the award-winning Xtreme Scream Park is full of thrills and spills this Halloween. The event includes six themed scare mazes, including Ash Hell Penitentiary, Hoodoo Voodoo, Stilton Hall Hotel and Hell Spa, The Pie Factory, The Village, and Curtain Chaos. There will also be a range of live entertainment for attendees to enjoy, including live music and street theatre. The team have numerous awards, including Best Scream Park and Best Halloween Attraction at the ScareCon Awards. Join West Midlands Safari Park for witches, wizards and werewolves in the Spooky Spectacular! event. New for 2018 is the Wizarding Workshop, where you can meet Walter the Wizard, make your own wand and help him cast an invisibility spell so he can escape. 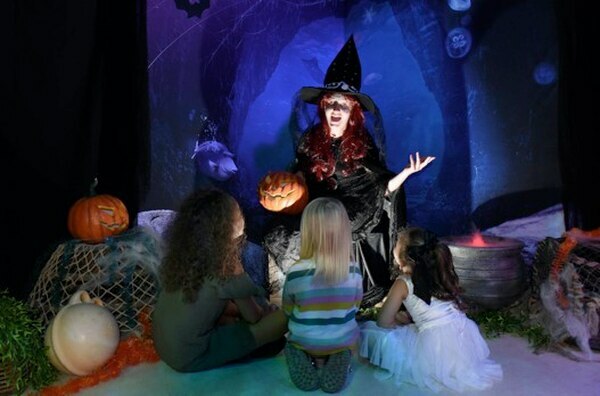 Visitors can also take part in a trick or treat trail with Glenda the Good Witch, and enjoy Ice Age: Legend of the Dire Wolf at the brand new Ice Age exhibit. There will also be an exclusive Halloween-themed sea lion show, Herring Potter and the Deathly Haddock, performed every day. New frights and family-friendly delights have been unveiled for this year's Scarefest at Alton Towers. This year will see the introduction of Project 42, a brand new action-packed scare maze that will be situated in Forbidden Valley and invite valiant volunteers to enter the underground Phalanx compound in a bid to outwit what awaits them inside. Attendees will need to find a vaccination for the human test subjects, which have been infected by a mutant antidote and escaped. They will need to use every shred of courage and determination to get in and out without contracting the infection. Project 42 will join the award-winning maze line-up including Sub Species: The End Games, Altonville Mine Tours, and The Welcoming: Be Chosen. In addition House of Monsters returns for 2018 with a new extended scene. Families can join a vlogger-turned-monster-hunter on a spooky walkthrough experience, set in a maze of seven live shows with laughs, frights, theatre and special effects, as they go on a modern day quest. Scarefest 2018 will also see the launch of the CBeebies Land Monster Ball offering a fun-filled Halloween party for families as they join their favourite CBeebies Land friends Ubercorn, Bing and Hey Duggee, for spooktacular games, dancing and much more. They’ll also get to enjoy CBeebies Land’s many rides and attractions at dusk. Pop-up shows and flashmobs will also be taking place across the theme park, including the arrival of the eerie Galatica Airways Crew and ghost pirates. Thrillseekers looking for even more blood-pumping action will also get to experience latest attraction Wicker Man in the dark for the very first time. Wolverhampton's Light House Cinema has announced its upcoming Classic Horror Season. The season will begin with 1931 classic Frankenstein on October 11, followed by iconic Richard Donner release The Omen on October 18. George A. Romero zombie flick Night of the Living Dead will be shown on October 25, followed by the likes of Sam Raimi shocker Evil Dead on October 31, Stephen King adaptation The Shining on November 1, Evil Dead II on November 8, The Wicker Man on November 15, and 2016 hit The Witch on November 22. The season will conclude with a screening of Bram Stoker's Dracula on December 5. Enjoy five scare attractions and a range of live entertainment at Screamfest. Mazes for you to explore, if you dare, include Insomnia, Dia De Los Muertos, Demonica, Love Hurts, and Freak Out. 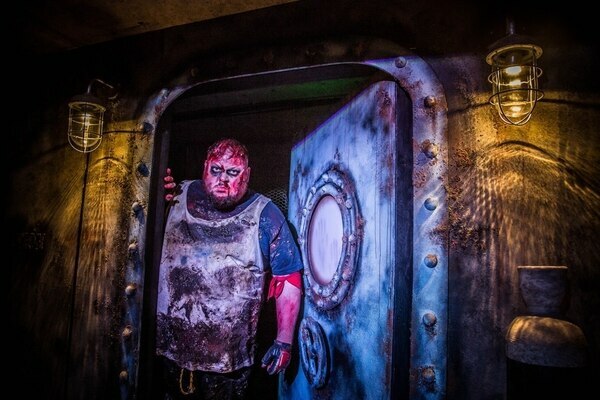 If you're too scared to step foot in the horror attractions, there a range of live entertainment for you to enjoy including extreme performers, paintball, live DJs and street theatre. 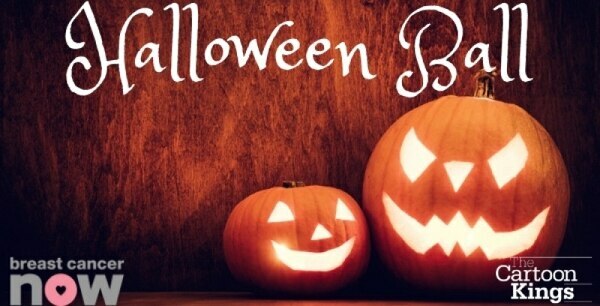 Recover from the scares with a wide choice of food and drink, including a licensed bar. Experience the true horror of the Halloween season at Shrewsbury Prison Scream Park. The site will be free roaming, which means you can wander at your own leisure... If you dare. There will be six mazes available for you to explore: House Number Seven, Jamboree Encore, The Cell, Phantom Finders, Experimental, and Shrewbury Meat Market. There will be a fully licensed bar in operation selling refreshments onsite. 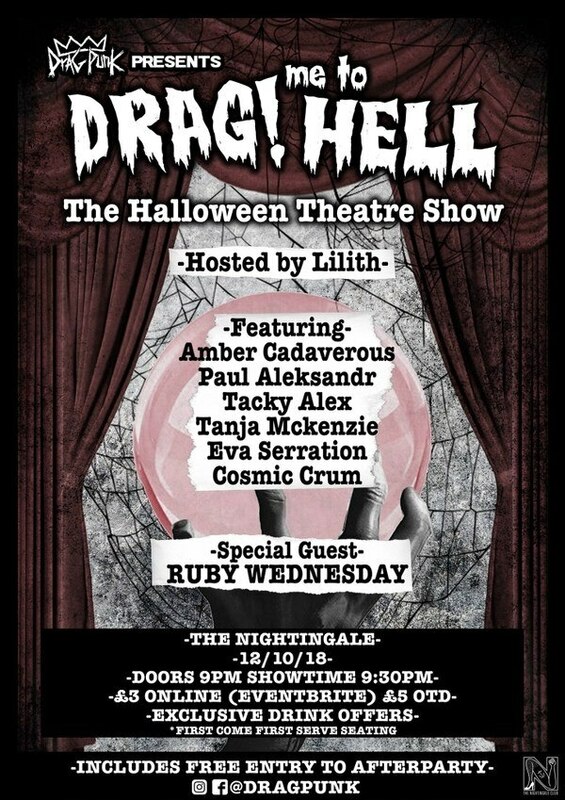 Birmingham drag quartet Dragpunk are set to host a special Halloween event at The Nightingale Club. The show, cleverly named Drag! Me To Hell, marks the start of the group's more ambitious approach to drag nights and performance shows, featuring a full narrative, decoration, production value and special guests. The members of Drag Punk - including Paul Aleksander, Lilith, Tacky - will perform at the show, as well as fellow Birmingham queens Tanja McKenzie, Eva Serration and Cosmic Crum. Fourth Drag Punk member Amber Cadaverous will be working behind the scenes for the night. They will also be joined by London queen Ruby Wednesday for the show. Matron Agatha will see you now as brand new scare attraction The Ward opens in Walsall. The scare maze follows the story of Birchills Psychiatric Hospital opened in the 19th century and run by nuns to this day. The hospital is said to house some of the most crazed patients ever known, including the infamous Sebastian who was moved from Ward 78 in Birmingham to The Ward now residing in Walsall. The Ward has never seen anyone enter or leave for several years - will you survive? 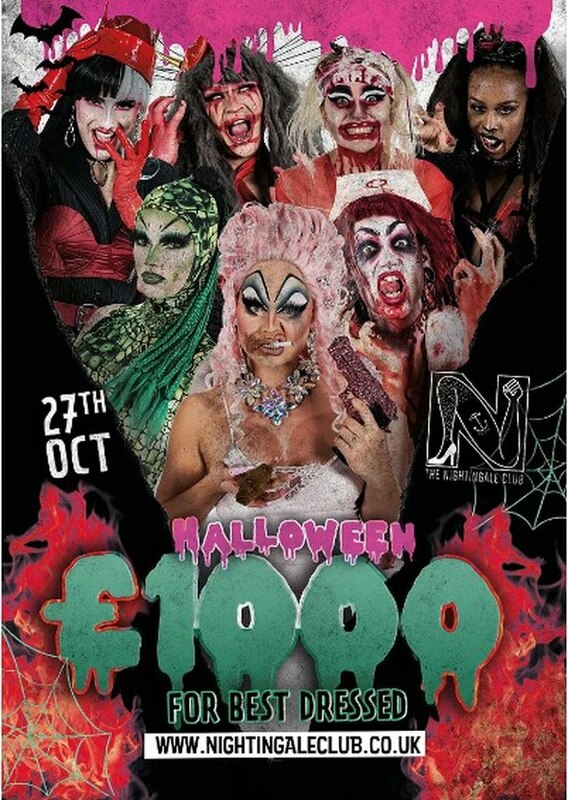 Birmingham drag group Dragpunk have joined forces with the minds behind alternative club night Emo Disco for one bumper Halloween party. Expect all your favourite alternative, emo, rock and scene kid music all night, with tickets starting at £3. There will be drink promotions on the night including the popular £10 specially-themed cocktail pitchers. Join Dermort O'Scary and his cast of gruesome gouls as The Scream Factor returns to Cadbury World for more frights than ever before. Frankie Frankenstein, Witchy Woo Woo and Wolfy the Wolfman have been rehearsing to win this year's mystery prize, but who will win? Come dressed in your most ghoulish garments to enter the Cadbury World Halloween Spooktacular fancy dress competitions each day over half-term. 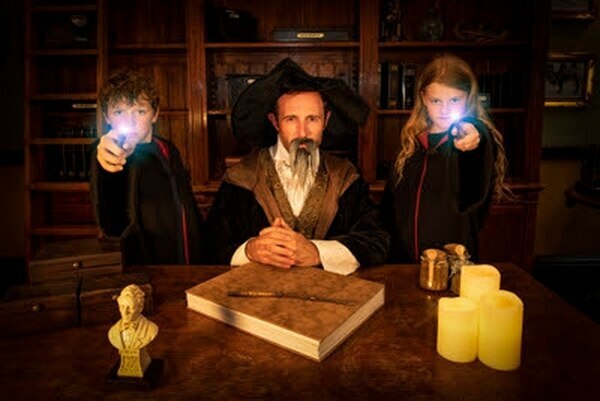 With wondrous witches, Horrible Histories and fearsome attractions - experience Warwick Castle's biggest ever Haunted Castle event this Halloween. Join a host of bizarre characters throughout the day for fun, games and spooktacular shows at the Dead Centre Stage, before enjoying the return of the wondrous witches at The Witches Tower. Take part in a spooky Halloween trail and journey through the enchanted Hollows where you’re sure to encounter creepy characters at every turn, and watch magnificent birds of prey take flight in a special spooky show. For brave visitors, tackle the terrifying House of Wax experience, experience horror attraction Outbreak 1369, take part in a seance, all before attempting to escape the 30 minute long escape room to set a wandering knight free. On top of this, the famous Castle Dungeon will be open for you to witness some of the darkest, bloodiest and most frightening times in the attraction's history. And that’s not all, each SEA LIFE centre will play host to a ‘selfie’ photo frame and ‘twister’ style game for guests to further immerse themselves in the spooky family fun. 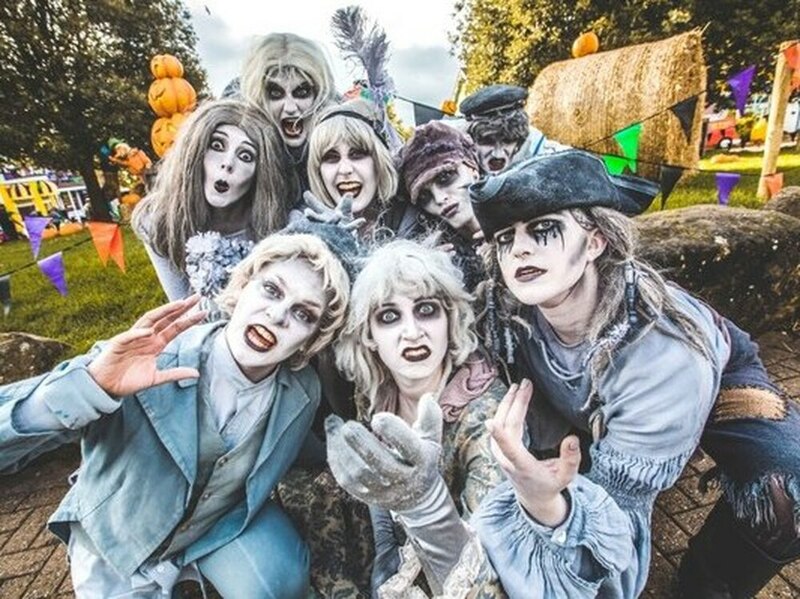 There are some frightfully fun family Halloween activities and eerie entertainment this October half term at Drayton Manor Park. The attraction is also offering accommodation packages for this event, if one spooky day is just not enough. 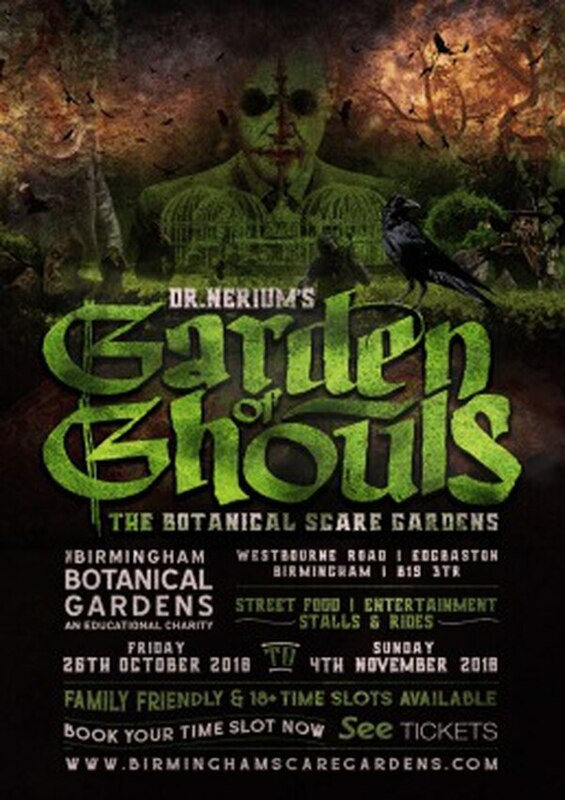 Take on the live action spooky trail through the Birmingham Botanical Gardens. The trail follows the story of Dr Nerium, who is said to have created a carnivorous flower in 1842. As time has gone by some of these experiments have produced truly terrifying results, something that he can no longer confine to the gardens. Many people have journeyed through the gardens, but none have returned. To settle your nerves from the frights of the trail, there will also be street food, performers, music and entertainment fit for the whole family. Gandeys Circus is set to be shocking audiences in Dudley this Halloween. The highly anticipated show, Greatest Showmen Tour: Halloween Spooktacular!, will be arriving at the intu Merry Hill Shopping Centre from October 26 to November 4 later this year. The show, which will take place in their Big Top venue and will be supporting Birmingham Children's Hospital. Celebrating the 250th anniversary of the Circus, this spooky performance is set to be the most spectacular one yet. 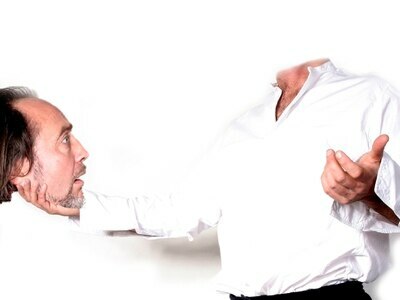 Based in the intu Merry Hill car park on Brierly Hill, it's a show that can't be missed. The show will feature performances by the gravity defying Havana Troupe, Las Chicas Morales, aerial wonders Jacqui and Brendan and the mystical and artistic Gina with the electrifying African Warriors, as well as Chico Rico the clown, creating mayhem wherever he goes. Watch street entertainers bring Halloween to life as you explore the eerie atmosphere at the Black Country Living Museum on Halloween Nights. Bring the whole family along including the kids treat bags for a sweet surprise as you trick or treat around the Museum’s houses and shops. Enjoy street performances from a range of costumed staff members, and even get your own face painted. Get spooked by tales told by candlelight, or even embark on the haunted mine experience - if you dare. From the macabre to the marvellous, enjoy this rare opportunity to visit Aston Hall at night, and enjoy the museum of curiosities under spooky circumstances. The event will take visitors back to 1858, to the grand unveiling of the Star of Al-Ara at the attraction. 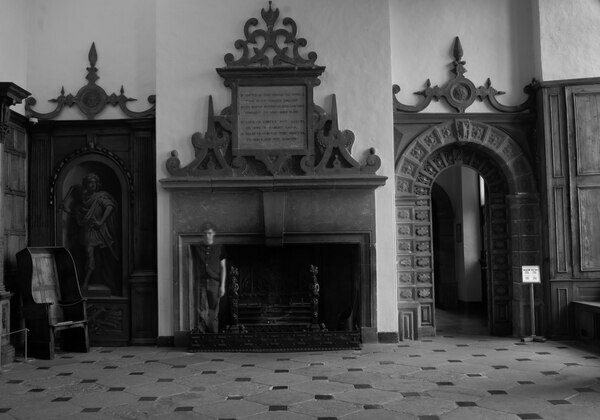 Witness the ghosts of the Hall’s past walking the corridors as the diamond’s power brings the past to life at this special event. Head down to the twelfth Halloween Tattoo Bash this month. You can peruse art work from a number of different tattoo artists covering a range of different styles, as well as entertainment and stalls. The event aims to raise money for local charities, and is set to host a charity auction giving away everything from clothing, tattoo sessions, collectibles and more. Attend a party like no other at Birmingham's O2 Academy this Halloween. 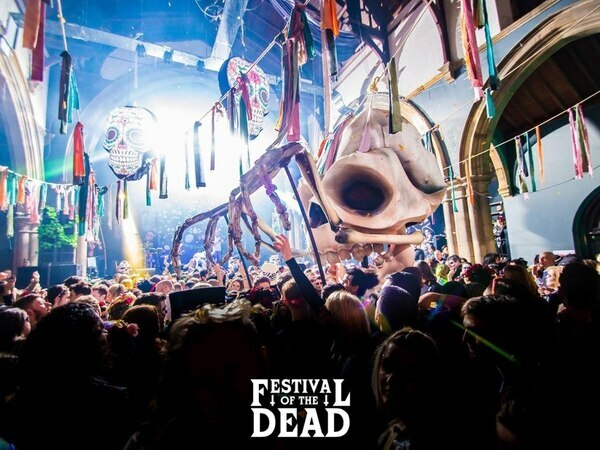 Festival of The Dead has resurfaced with a new hoard of characters and creations, from a 15ft tall vulture roaming the crowd, to giant skulls and carnival processions. Uprawr's annual Halloween bash will return got 2018. The event will see the venue completely made over with a series of terrifying horror set pieces and props, as well as a car being 'burnt out and flipped over' on stage during the night. There will be a costume competition in place for attendees to win anything from a full role of electrical tape, to a Chromebook laptop. An after-party will take place in the upstairs bar and smoking area until 6am, with drinks offers available all night. Planet's annual Halloween party is returning on October 27. Running until 6am the following morning, revellers will be able to enjoy drinks from £1 from one of three different bars. There will be prizes on offer for the best costumes, including an Xbox One, Playstation 4, or an entire day sitting at Poison Apple Tattoo. Relive all of your favourite 80s horror films during this party at Perton Park Golf Club. There will be an 80s DJ playing a selection of hits from the era, while you enjoy the drinks promotions on offer for the night. A Halloween market is heading to Wolverhampton. Spooks, ghouls, wizards, witches and regular Friday market traders will all be made welcome on this terrifying occasion, along with any number of stalls selling Pagan potions, gins, spirits and bloody cocktails to warm the chilliest ghost. 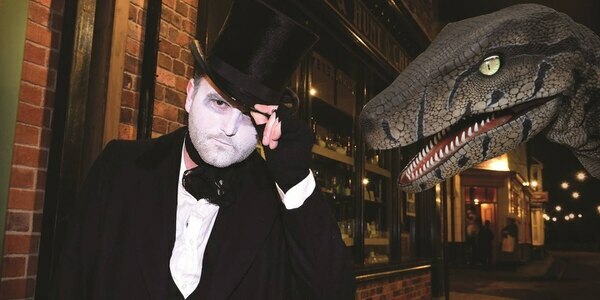 Dress up in your most frightening Halloween costume and join the ghosts, ghouls and monsters at Blists Hill Victorian Town for the annual Ghostly Gaslight Night. New for 2018, beware of dinosaurs rampaging around the town and lizard like mutant Victorians walking the streets. For one night only the Victorian shops and cottages are occupied with gruesome characters and wild apparitions. Mummies, wizards and werewolves are taking over the town, so expect scary encounters around every corner. You can also face your fears at the frightening fairground as you take to the rides after dark. Word of Mouth Events return with their annual Halloween party - and this time, the theme is Day of the Dead. Don your best sugar skull makeup and enjoy live performances from DJ Stuart Ojelay, Dan Warby, Rob Cook, Joe Williams and more throughout the night. Tickets are on sale now, with VIP upgrades available including entrance for up to 10 people, a table space, and wait service all night. The Buttermarket has a spooktacular event planned for Halloween. The venue will be decked out in Halloween decor with three rooms of music, and will be hosting a Grey Goose giveaway. To enter, simply claim your free £2 off entry voucher from Fatsoma before midnight on Friday, October 26 and five winners will be announced at random. Nightingale Club's Halloween event returns for a gruesome night of fun. A whopping £1,000 is up for grabs in the costume competitions, and there will be three floors and four rooms of music and entertainment. There will be a series of drag performances throughout the night, including a guest appearance from Ghost Elektra. 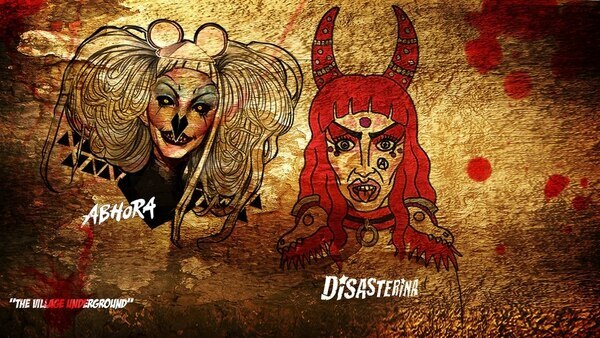 Dragula performers Abhora and Disasterina will perform at Birmingham's Village Inn this Halloween. The duo both rose to fame during The Boulet Brother's Dragula season two alongside the likes of James Majesty, Victoria Black, and Biqtch Puddin'. Abhora appeared at Birmingham's Nightingale Club last month as part of the Dragula tour's first ever UK dates. They will be joined by Wyntir Rose, Kitten T, Kitty Tray and Dragpunk for the show. Enjoy all things spooky at Bantock House's All Hallows Eve festival and market. Expect to see an array of street food, gory cocktails, crafty ales, artisan vintage and craft stalls. There will also be live music, face glitter painting, a living statue and more to entertain crowds. 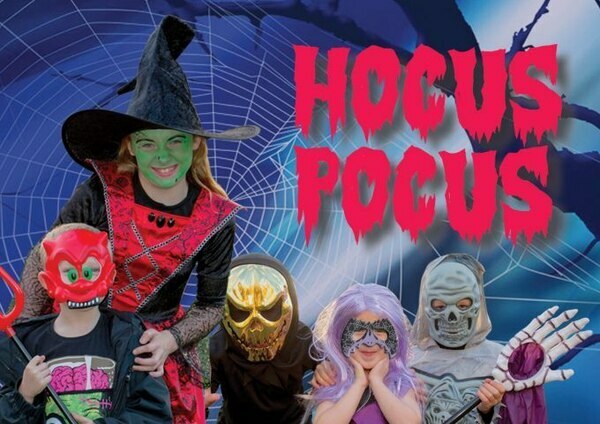 Enjoy creepy crafts and spooky fun at Halloween Hocus Pocus at Dudley Zoo. Take a selfie with Lou the Bat, and embark on the trick or treat trail around Dudley Castle, but be careful, there will be creepy crawlies and a few surprises along the way. The whole family can enjoy Dippy's Halloween show and disco, as well as the freaky fancy dress parade. Join Weston Park for a series of spooky craft activities. Craft activities and pumpkin carving will be among the activities on offer, as well as trips on the miniature railway. 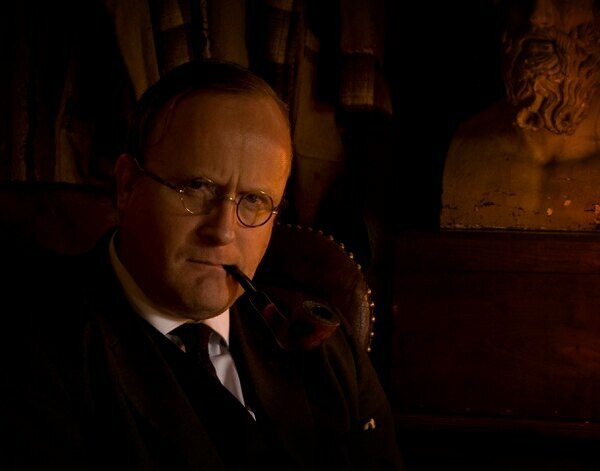 Ghost Writer star Robert Lloyd Parry will reprise his role as acclaimed novelist M R James for this eerie solo show. Over two nights, the actor will read novels A Warning to the Curious and Oh Whistle... by candlelight at Stafford Gatehouse Theatre. A Warning To The Curious follows the tale of a young archaeologist who is haunted and hunted by the guardian of an ancient treasure. Oh Whistle... is a story of nocturnal horror of the Suffolk coast, and is widely considered to the the author's masterpiece. 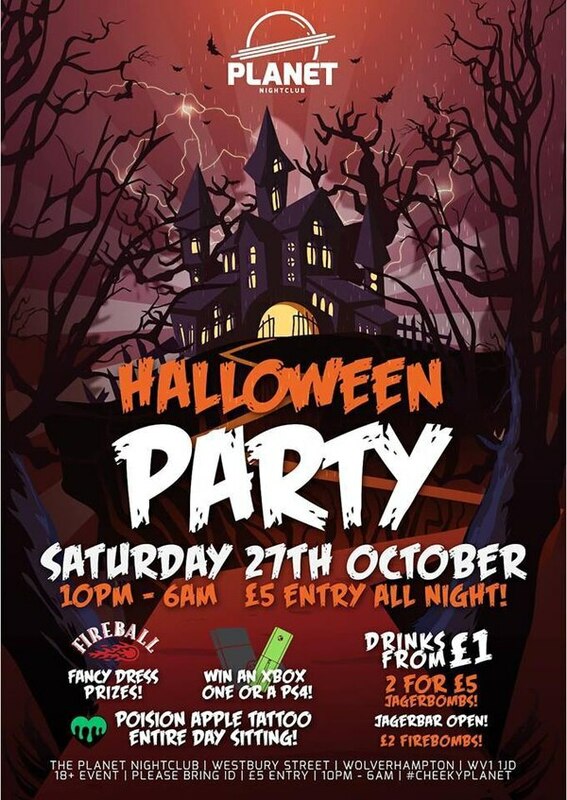 Join The Moat House for their charity Halloween Ball. Tickets include arrival drinks, a three course dinner, and live music from The Cartoon Kings. £5 from each ticket sale will be donated to Breast Cancer Now. Wolverhampton's biggest city wide event is back for Halloween. BOOM Bar Crawl's Night Of The Dead event will take place across The Royal London, Yates', Popworld, The Grain Store, The Bohemian, The Prince Albert, The Planet Nightclub and Wolverhampton Academy with themed drinks and entertainers. Those that wish to take part must purchase a pod t-shirt ahead of the event.